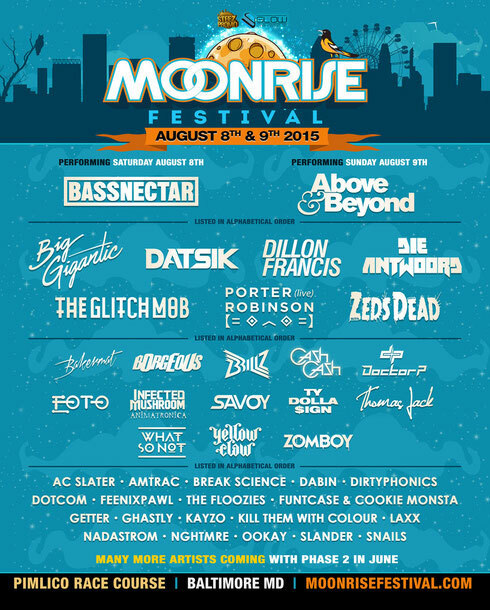 After an inaugural run in the summer of 2014, Moonrise Festival - Baltimore’s only electronic music festival – returns to the Pimlico Race Course on Saturday 8 August and Sunday 9 August. Festival founders Steez Promo and Glow DC have upped the ante this year with a lineup that traverses the dance music map. Joining festival headliners Bassnectar (Saturday) and Above & Beyond (Sunday) are the likes of Big Gigantic, Datsik, Dillon Francis, Die Antwoord, The Glitch Mob, Porter Robinson (Live), Zeds Dead, Bakermat, Thomas Jack, What So Not, Yellowclaw, Zomboy and more. Phase 2 Line Up will be announced in June.